Our merry gang of teenagers is now back in New York city after the crazy Idris events and are trying to go on with their lives. Alec and Magnus on a lovers trip, Clary training to become a Shadowhunter, Simon and Isabelle dating while he tries do deal with vampirism and his new mark, but Jace, on his part, is having a hard time. He is plagued by nightmares in which he is hurting Clary. Top that with his family heritage and his grief over Max and we are light years away from a good time. There’s no time for dwelling though, Shadowhunters are found dead, someone is trying to kill Simon and a very powerful vampire is in town. Could there be a new Nemesis to defeat? Can they win this time? And what will be the price? Oh. My. Freaking. God. This is textually what I said aloud after reading the last word of City of Fallen Angels. Can we frame Cassandra Clare for massive murder attempt? Because this, my friends, is a KILLER cliffhanger. WOW. Ok now that it’s out of the way, let me tell you how amazing City of Fallen Angels is. What hit me the most in this installment is that every character seemed to be reestablishing their identity. They are trying to find their basis after everything that happened and it opens to a lot of vulnerability from all of them. I feel like I know the characters in a much more profound way now than I did before, and it’s amazing. When Cassandra was talking about CoFA she said this book was a lot more about Simon. And while he does have a much bigger part and his struggles are super interesting, Jace stole the show for me. Not because he was his cocky flamboyant self but quite the opposite. His pain and vulnerability was sometimes hard to bare. I just wanted to give him a hug and never let him go. His misery was heart-shattering. I have to say Clary kind of annoyed me. I can’t say I blame her because I don’t know how I would’ve reacted in her position but I wanted to smack some sense into her sometimes. A new character I’m quickly growing fond of was also introduced. And for those of you who’ve read Clockwork Angel, two of its characters are also present/mentioned, which makes me that much more anxious to read The Clockwork Prince. I was also super happy to see Magnus, and I can never get enough of him so I wished he was a bigger part of the book but hey, can’t have it all! The plot moved at a steady pace and the intrigue was really strong. There were so many things going on at same time that I was breathless just for reading and I had to put the book down a couple of times because the tension was just too much. Everything happens at freight train speed and Cassandra doesn’t give you time to try and figure out what’s going on. It’s Keep on Rolling and stay on the bench. As mentioned previously, the end is a killer. I felt drained and full of dread after the final battle and then Cassie ties-up the loose ends, you’re hopeful for a brighter future and when you let your guard down.. BAM! Cassandra Clare strikes again! The Mortal Instruments is one of the best YA Fantasy series out there and if you haven’t read it yet, you are seriously missing out. 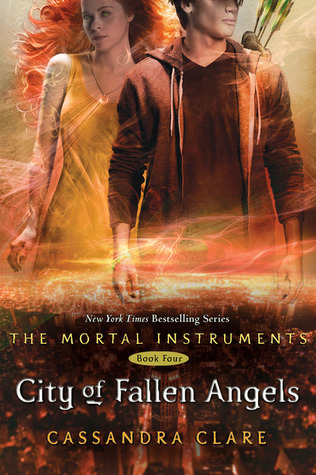 City of Fallen Angels is fast, furious, emotionally draining and oh so fabulous! I want to read it all over again! "You love each other -anyone can see that, looking at you- that kind of love that can burn down the world or raise it up in glory"
This is the first review of CoFA that I read. It's nice to know that you enjoy it. I think I should have started reading the first book of the series soon. My own copy of CoFA will be here about three weeks. Fantastic review! I love the quotes you included (the first one cracked me up). Glad you enjoyed it - I can't wait to get started! *SQUEE! * I really need to read this one!! The mortal instruments is such an awesome series! I read the first three books in one week! *sigh* i can't wait for my finals to be over! OMGI just need to get this!